The pace of technological progress has been a little underwhelming in recent decades. Let's be honest: Checking your Facebook feed in the bathroom isn't something to be proud of. Not in the way we were proud of putting a man on the moon. Or breaking the sound barrier. Or democratizing air travel. Instead, humanity pumped the brakes and focused on things like making information flow more freely, being more efficient with natural resources and putting granite countertops in Miami condos. Yes, we have computers in our pockets, Amazon Prime and the beginnings of robot autonomy. But the space shuttle and Concorde don't fly anymore. Cars aren't moving any faster on the interstate. And airliners are built for miles per gallon instead of Mach numbers. But it feels like the pace is picking up again. A generation of big-tech billionaires, inspired by the great sci-fi works of the post-war era, are ushering in a future of private industry in space. 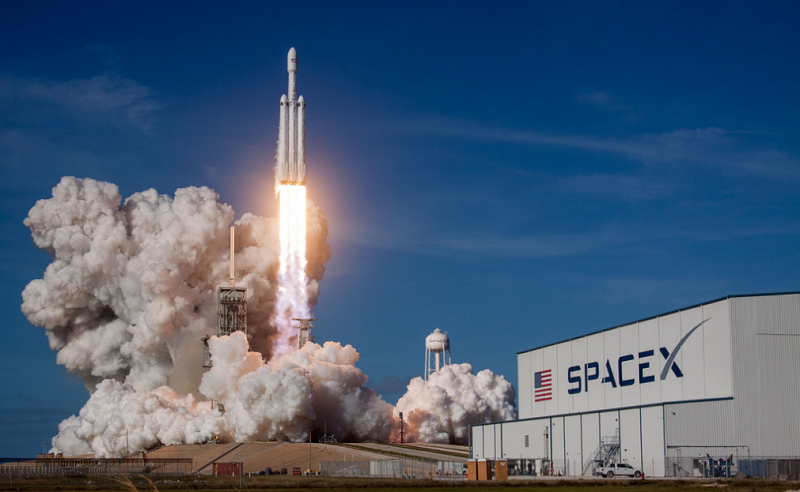 Elon Musk's SpaceX, one of the world's most valuable private companies, is the tip of the spear, aggressively driving down the cost of launch. For global VC activity in the space, liftoff was achieved in 2017: Capital invested topped $2 billion, per PitchBook data, besting the previous seven years combined. 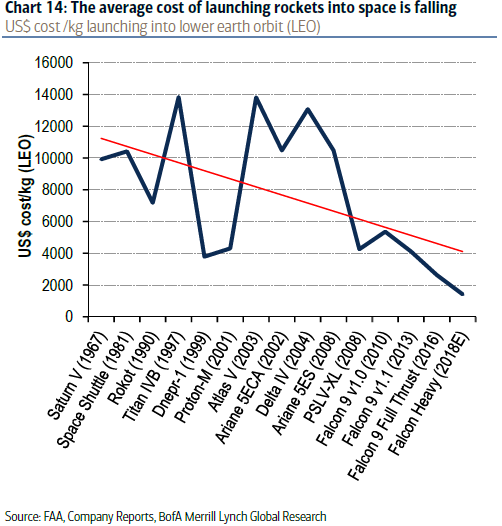 Bank of America Merrill Lynch analysts predict a space market that is worth $339 billion today will grow to $2.7 trillion by 2045. The Saturn V that took man to the moon cost around $1.16 billion in today's dollars per launch, according to Merrill Lynch. The Space Shuttle program cost about $450 million per launch in its final days in 2011. The Falcon 9, the predecessor to the Falcon Heavy, launched for just $57 million back in 2013. This is a result of the intense focus of SpaceX, as well as Jeff Bezos' Blue Origin, on reusable rockets. Both founders have described the current state of throwing away a rocket after a single use as the equivalent of trashing a $300 million Boeing 747 after a one-way flight. Fuel and oxygen are cheap, with Musk estimating that, assuming 1,000 launches on a single rocket, the cost per launch could fall to just $50,000. Other smaller startups are aggressively pursuing that dream, with New Zealand-based Rocket Lab looking to lower small satellite launch costs to just under $5 million per lift with its "Electron" rocket, powered by 3D-printed engines. The company raised a $75 million Series D venture round last March in a deal led by Data Collective, with Bessemer Venture Partners and Khosla Ventures among the participants. Money is coming into the sector, with Seraphim Capital launching the first dedicated VC-fund focused on space in 2016 with nearly $140 million under management and close to $126 million in dry powder. 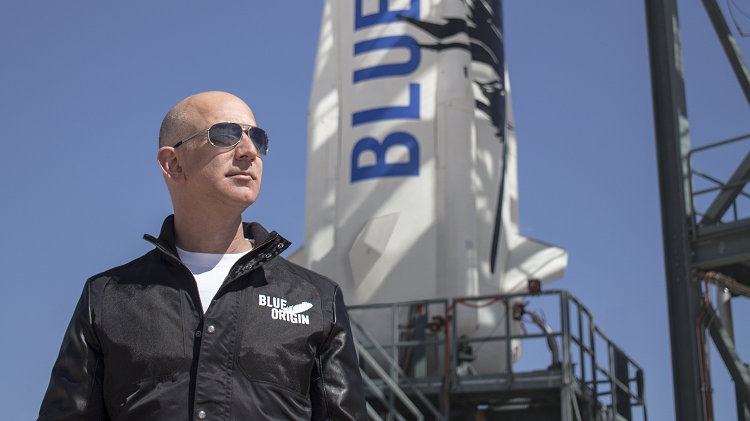 Bezos is believed to have invested more than $1 billion in Blue Origin since 2000 and plans to quicken that pace with a $1 billion-per-year investment going forward. Google and Fidelity poured $1 billion into SpaceX in 2015. SoftBank and others invested $1.2 billion in satellite constellation internet startup OneWeb in 2016. And Tencent has invested in Planetary Resources, an asteroid mining company. Sovereign wealth funds are getting into the game as well, with Abu Dhabi-based Aabar Investments putting $280 million into Virgin Galactic in 2009 and Saudi Arabia's Public Investment Fund announcing last October it was putting $1 billion into Sir Richard Branson's three commercial space companies: The Spaceship Company, Virgin Galactic and Virgin Orbit. Merrill Lynch estimates that between 2000 and 2005, there was an average of eight investors per year in space companies. From 2006 to 2011, the average was 23. And from 2012 to 2016, it was 93—almost a 12-fold increase compared with the first five-year period. Along with rapidly falling launch costs, motivations for the increase include the approach of the space tourism industry and the immense wealth potential of space mining. According to John S. Lewis, author of "Mining the Sky" and professor emeritus of planetary science at the University of Arizona's Lunar and Planetary Laboratory, just one asteroid—3554 Amun, to be precise—is thought to contain $6 trillion worth of cobalt. The Federal Aviation Administration estimates space tourism demand could total $1.6 billion over a 10-year period. President Donald Trump is reaching for the stars as well, with a desire to see Americans on Mars. Something that is expected to cost $230 billion. Private industry will play a key role, with SpaceX planning its own moon orbital and Mars landing missions while Blue Origin wants to create an "Amazon-like" shipment service that would ferry resources to the moon, widely viewed as a jumping off point for any excursion to the red planet. And Trump wants it soon. "We want to do it during my first term and at worst during my second term." His admonishment? "So, we want to speed that up. OK?"